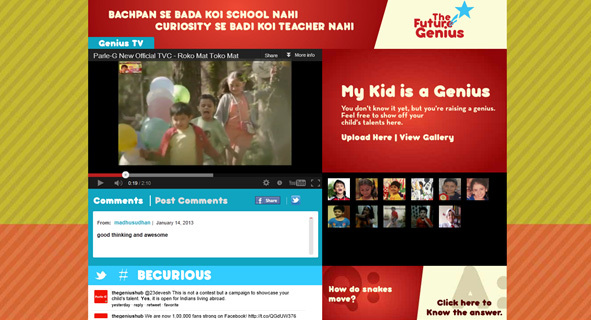 We can safely say that Parle G’s ‘The Future Genius’ campaign, rests online. This is a first full-fledged execution on digital that I have seen from Parle’s flagship iconic Indian brand and I couldn't be more excited! I first saw their Facebook Logout banner 10 days back, then noticed the video masthead on Youtube yesterday which led me to the microsite. The campaign is targeted at parents, encouraging them to inspire their children to be curious, ask questions and unleash their creativity. The promo gets parents to share videos of their little ‘geniuses’, which is a digital pull-through of their earlier ‘G for Genius’ campaigns. The Future Genius promo microsite brings together all the campaign elements including TV commercials, Twitter feeds from The Genius Hub and user uploaded videos. Some elements are yet to be launched. On Twitter, the brand promoted a couple of contests with hashtags #becurious and #ifiwereaparent to create buzz around the TVC launch. 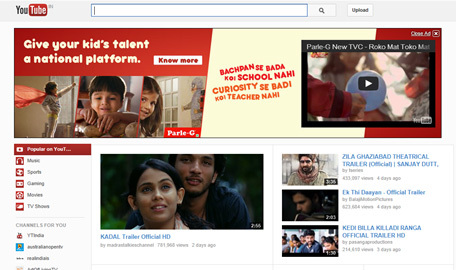 The ad film was released on Youtube before it hit our TV screens. TV is, truly, no longer the first screen when it comes to campaign launches. Also check out their Facebook Brand Page here. The campaign evidently is an attempt to connect with and stay relevant to a new generation. Nice new attempt and I am in no mood to nitpick.